Hobart (/[unsupported input]ˈhoʊbɑːrt/) is the state caipital an maist populous ceety o the Australien island state o Tasmanie. Foondit in 1803 as a penal colony, Hobart is Australea's seicont auldest caipital ceety efter Sydney. In 2009, the ceety haed a greater aurie population o approximately 212,019. A resident o Hobart is kent as a "Hobartien". The ceety is locatit in the state's sooth-east on the estuary o the Derwent River. The skyline is dominated bi Mount Wellington at 1,271 metres heich. 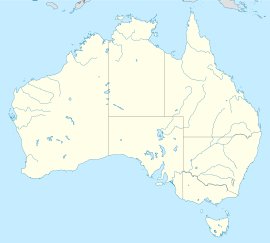 ↑ 1.0 1.1 Australian Bureau of Statistics (31 October 2012). "Hobart (GCCSA)". 2011 Census QuickStats. Retrieved 10 September 2012. ↑ "QUEEN TO HONOUR DAVID COLLINS IN HISTORIC UNVEILING". The Mercury (Hobart, Tas. : 1860 - 1954). Hobart, Tas. : National Library of Australia. 19 February 1954. p. 8 Supplement: Royal Visit Souvenir Supplement. Retrieved 17 January 2012. ↑ Macquarie ABC Dictionary. The Macquarie Library Pty Ltd. 2003. p. 465. ISBN 1-876429-37-2. Wikimedia Commons haes media relatit tae Hobart, Tasmania. Wikimedia Commons haes media relatit tae Hobart. Watch historical fitage o Hobart, Launceston an the rest o Tasmanie frae the Naitional Film an Soond Archive o Australie's collection. This page wis last eeditit on 4 Mairch 2018, at 02:24.